Dr. Power is a Consultant Radiologist and Dr. Bent is Specialist Registrar in Radiology, Department of Medical Imaging, Royal London Hospital, Whitechapel, London UK. Dr. Chan is a Consultant Radiologist, London Independent Hospital, London UK. This material in this article was presented in educational exhibit form at the Radiological Society of North America Meeting, December 2004. 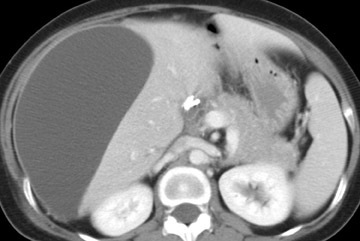 Cystic liver lesions in adults can have a number of etiologies, including congenital, neoplastic, and infectious conditions, as well as trauma and miscellaneous entities. While most such cystic lesions are benign and are frequently clinically irrelevant, the radiologist must be able to recognize key imaging features to enable the diagnosis of the more clinically important lesions. Features to assess include lesion size, the presence and thickness of a wall or any internal septations or mural nodules, the presence of either internal or mural calcification, and the pattern of enhancement following intravenous contrast. The importance of the clinical history in these patients cannot be overstated. Ultrasound, computed tomography (CT), and magnetic resonance imaging (MRI) can act in a complementary fashion to optimize lesion characterization. Ultrasound can reveal internal septations, mural nodules, and debris in a lesion. 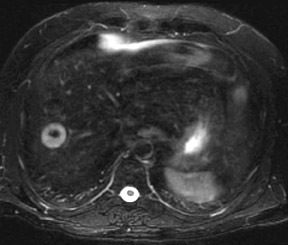 CT can show wall or septal calcification, while the signal characteristics of the cyst content on MRI may define its contents, for example, if it is hemorrhagic. MRI is the best imaging modality for detecting wall enhancement. 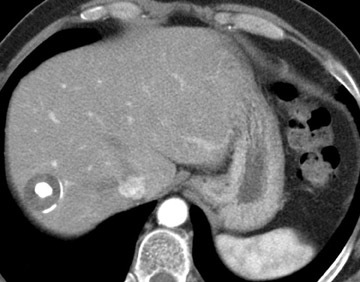 Knowledge of the imaging features of the most common types of cystic liver lesions should enable an accurate diagnosis to be made and should potentially avoid the need for cyst aspiration or needle biopsy. Also known as von Meyenburg complexes, bile duct hamartomas arise from ductal plate malformations that involve the small interlobular bile ducts. 6 They are seen in up to 3% of autopsy specimens 8,9 though in only 0.7% of CT studies; 10 44% of bile duct hamartomas are thought to be occult on CT. 8 They typically are small lesions that range from 2 to 15 mm in diameter; the larger lesions may, in fact, constitute an aggregation of smaller lesions. 10 They are generally scattered throughout the liver, are of uniform size, and are rounded or oval. While there is some variability in their imaging appearances, they are typically anechoic on ultrasound and of fluid density on CT, low SI on T1W MRI and high SI on T2W MRI. 8,9,11 Their enhancement following contrast administration is variable; no enhancement, rim enhancement, and slow homogenous enhancement have all been reported. 8,9 The differential diagnosis for multiple small cystic liver lesions includes simple cysts, microabscesses, granulomata, and metastatic disease. The small and uniform size is unusual in simple cysts and metastasis, while clinical correlation is obviously essential to discriminate hamartomata from other imaging possibilities. Imaging features are ultimately nonspecific, and needle aspiration may be required in some cases. This is a rare malignant tumor that is usually seen in teenagers and that frequently manifests as a large, solitary, predominantly cystic mass. The cystic appearance relates to the high water content of the myxoid stroma. 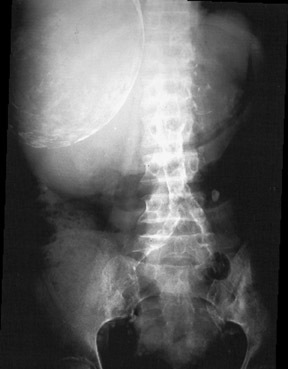 13 It is usually a multiseptate lesion with a variable, predominantly peripheral solid component. 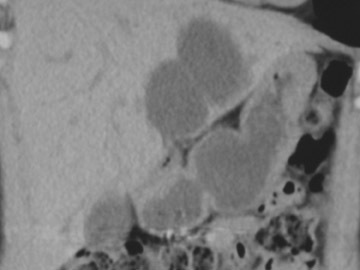 The multiseptate nature may be better appreciated on ultrasound and MRI than on CT. MRI generally shows a focal mass with multiple cystic spaces, septations, and central necrosis. 14 Following contrast administration, there may be heterogenous enhancement of the solid components of the tumor. As with all cystic lesions, intralesional hemorrhage will alter the signal characteristics, typically increasing the SI on T1W imaging. While this is a rare tumor, the diagnosis should be borne in mind when a teenage patient presents with a large, solitary cystic mass. These are rare, slow-growing, multilocular cystic tumors derived from biliary epithelium, although they generally do not communicate with the biliary system. 5 The subepithelial stroma may be similar to ovarian or be of mesenchymal histology. 4,15 Histological types include mucinous (the commonest type), serous, and papillary. 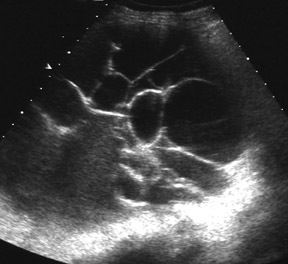 They are most frequent in middle-aged women and on ultrasound are seen as a multiloculated cyst. 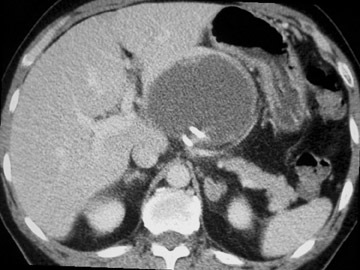 CT usually reveals a solitary, well-defined cystic lesion with a thick, fibrous capsule; mural nodules, internal septations, and, occasionally, capsular calcification may also be seen (Figure 4). MRI may also show nodules and septations, which are more commonly seen in the adenocarcinoma variety. However, neither radiology nor cytology of cyst fluid is reliable enough to discriminate adenoma from adenocarcinoma; thus, if this diagnosis is suspected, surgical resection is essential. 16 The prognosis is good if the tumor is completely resected, but recurrence is frequent if resection is incomplete. The liver is second only to lymph nodes as a site of metastatic disease, and liver metastases are 20 times more common than primary liver tumors. 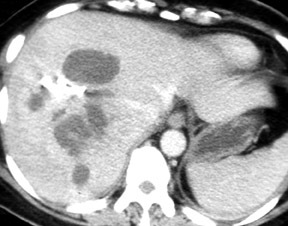 4 Metastases in the liver may be cystic for a variety of reasons. 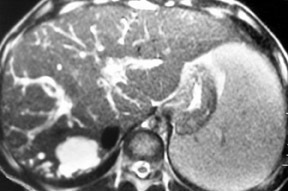 Metastases that become necrotic will appear cystic at imaging, which is most commonly seen in hypervascular metastases--for example, from a neuroendocrine tumor or sarcoma. 20 Mucinous primary tumors such as colorectal or ovarian tumors frequently give rise to cystic metastases (Figure 5). In the case of a cystic ovarian primary tumor, metastases have been reported to evolve into cystic lesions, even if they were initially solid. 21 Also, metastases may undergo cystic change with response to treatment, which has been reported in the case of metastases from a testicular teratoma 22 and a gastrointestinal stromal tumor. 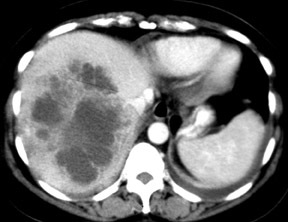 23 On imaging, cystic liver metastases may show variable wall thickness, and, on MRI, enhancement and fluid-fluid levels may be seen. 4 Their imaging appearance will vary depending on the primary tumor and the stage of treatment. A hydatid cyst is caused by an infection with the eggs of the echinococcus species of tapeworm; E granulosus is the more common type, with E multilocularis causing the infection alveolar echinococcosis. 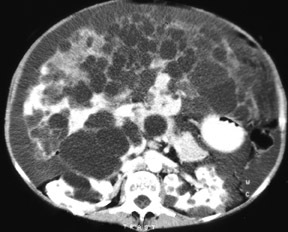 Rarely, pancreatitis may cause the development of a pseudocyst in the liver, usually in the left lobe. 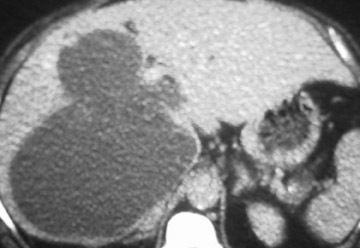 This diagnosis is suggested by both the patient's medical history and the imaging features of pancreatitis. MRI is the optimal imaging modality to distinguish pseudocyst contents such as hemorrhage and debris, although intralesional hemorrhage may cause an increase in the attenuation on CT. These fluid collections usually become better defined with time 1,4 (Figure 10). 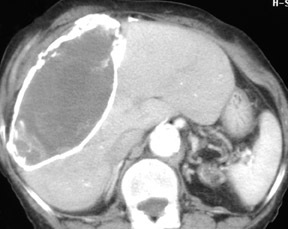 A hematoma in the liver may be due to surgery, trauma, or a bleed from a liver lesion. In cases caused by surgery or trauma, the diagnosis should readily be suggested by the clinical history. 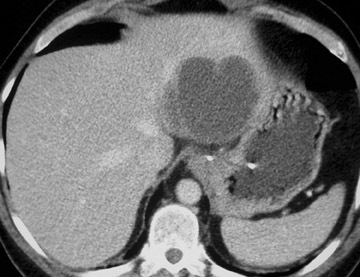 The most common liver lesions that bleed spontaneously are an HCC and an adenoma. 13 Areas of focal nodular hyperplasia, metastases, or hemangiomata very rarely bleed. 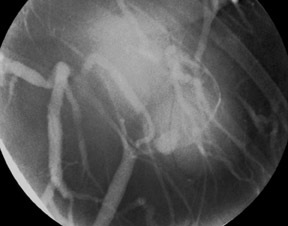 As with hemorrhage anywhere in the body, the imaging appearances vary depending on the chronicity. For example, a subacute hematoma may have increased SI on T1W MRI because of the paramagnetic effects of methemoglobin. After approximately 10 days, a hematoma is usually of fluid attenuation and has the imaging appearance of a cystic lesion. There are many causes of cystic liver lesions with a huge variability of clinical significance attached to them. Awareness of the clinical history is always useful in narrowing the differential diagnosis. However, given the regularity with which these lesions are encountered in everyday practice and their often nonspecific clinical presentations, it is also essential for radiologists to be armed with knowledge of the key imaging features of the more important lesions. Avoiding the need for aspiration or biopsy, if at all possible, must be a primary goal for the radiologist. 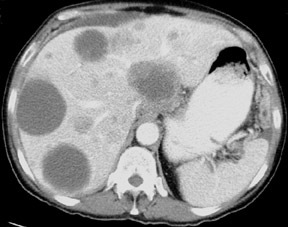 Imaging of cystic liver lesions in the adult. Appl Radiol.